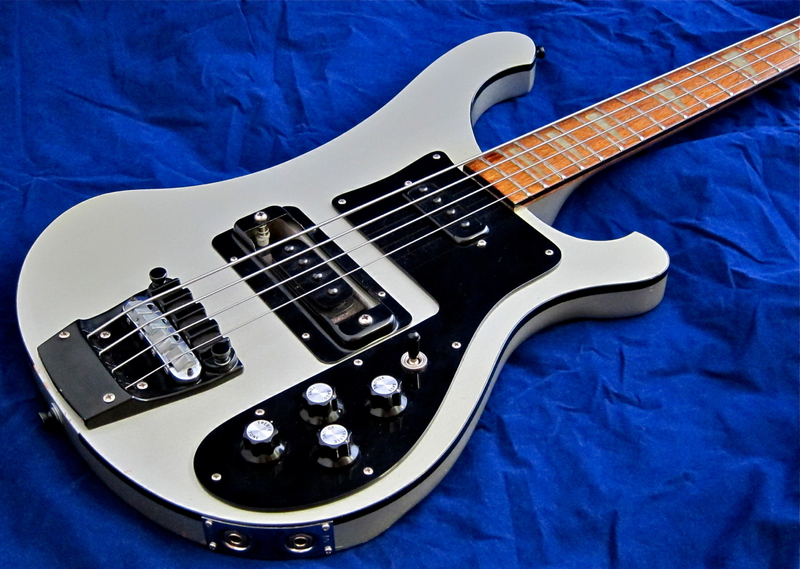 My Rickenbacker 4003 is finished in silver, and sports the black hardware so common on 1980s Rickenbackers. 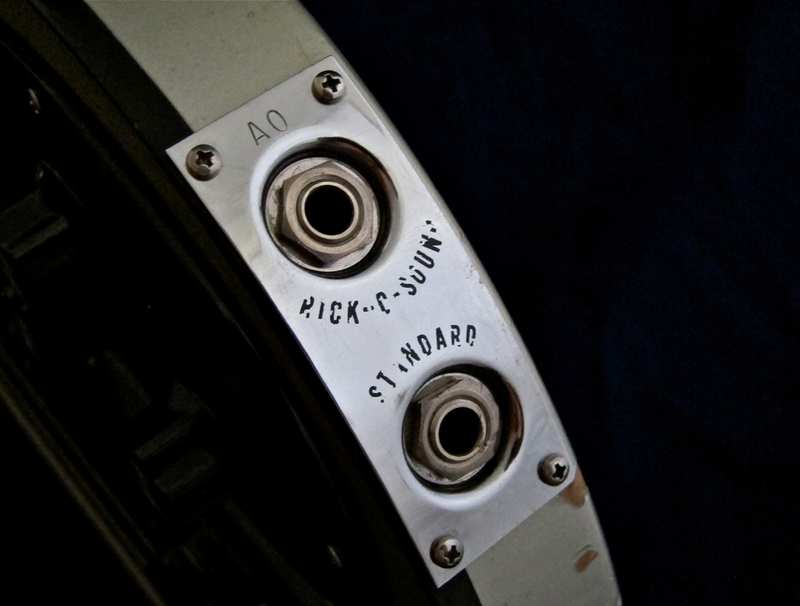 Old Rickies from the 1960s use Kluson tuners. 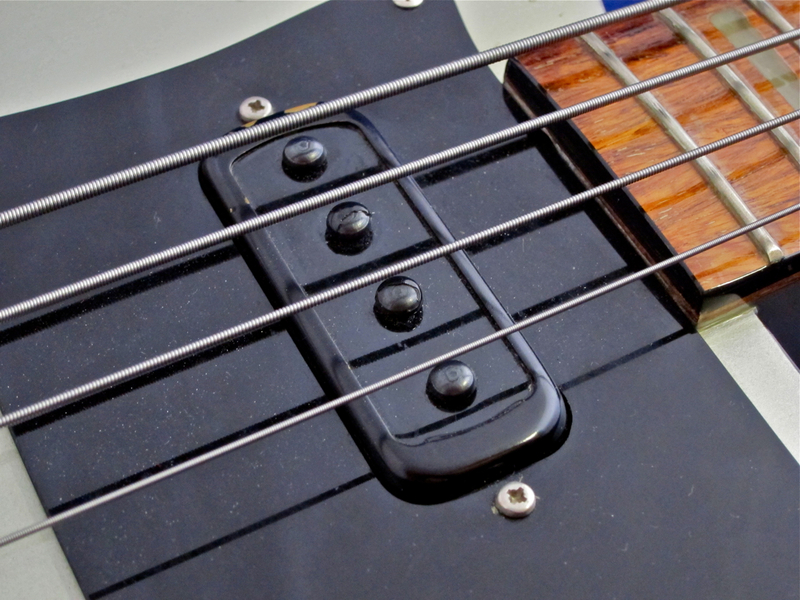 Seventies models were most often equipped with Grover tuners. 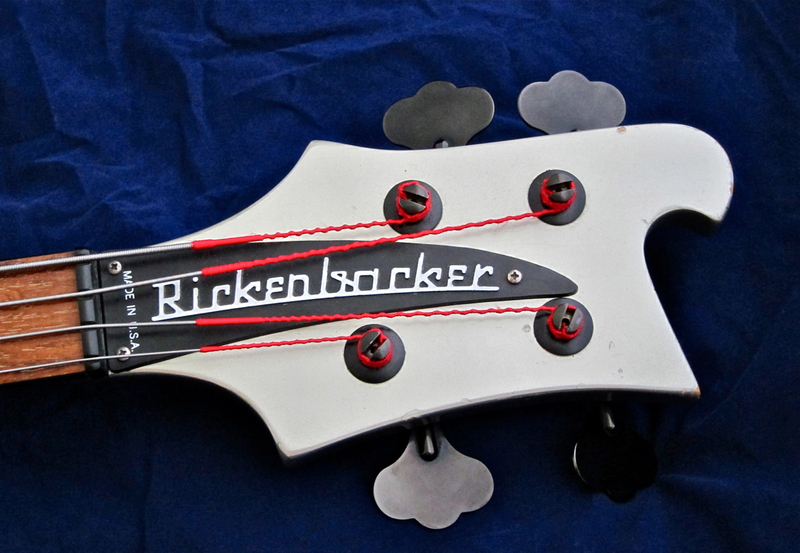 By the Eighties Rickenbacker had switched to Rickenbacker-branded Schaller tuners from Germany. 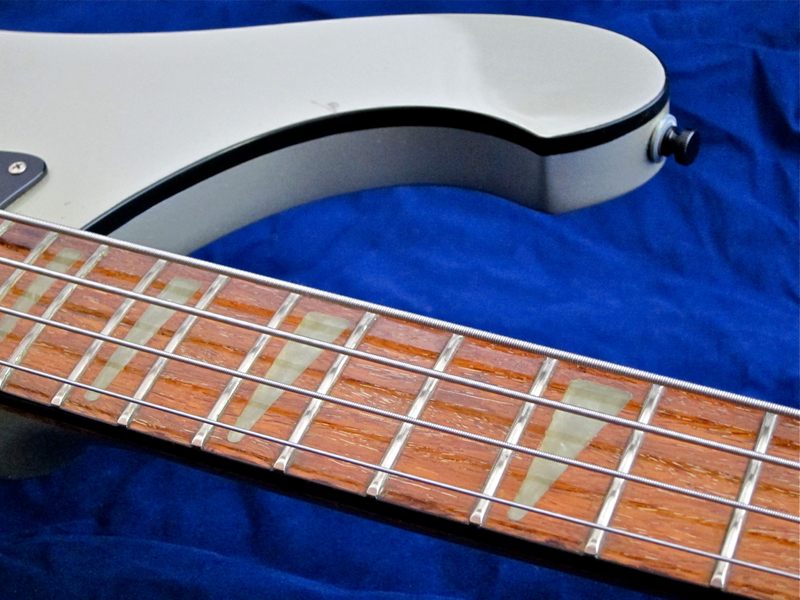 The original 4001 basses featured triangular ”shark-fin” inlays that went all the way from one edge of the fretboard to the other, effectively cutting the ’board into many pieces. 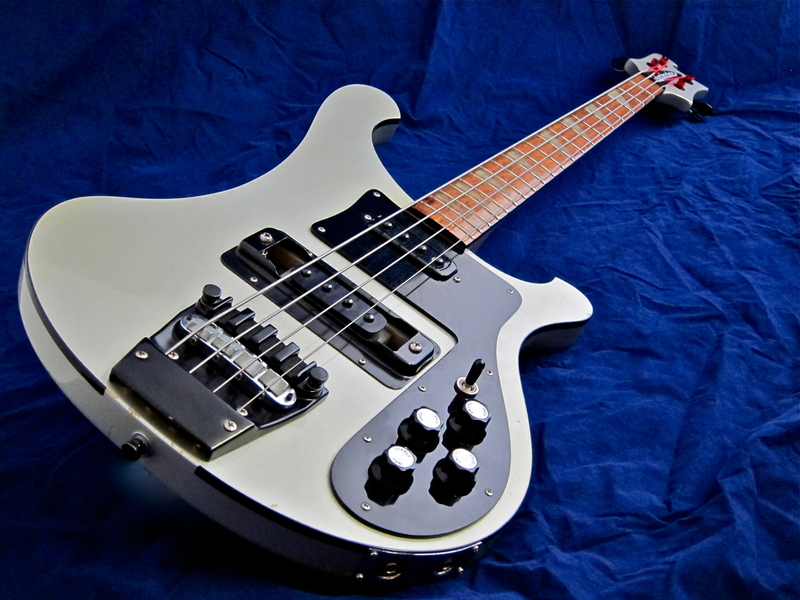 The Rickenbacker 4003 has redesigned and slightly smaller inlays. Viewed from the top both singlecoil pickups seem identical. While the units feature virtually identical polepieces and coils, they do differ in the details. 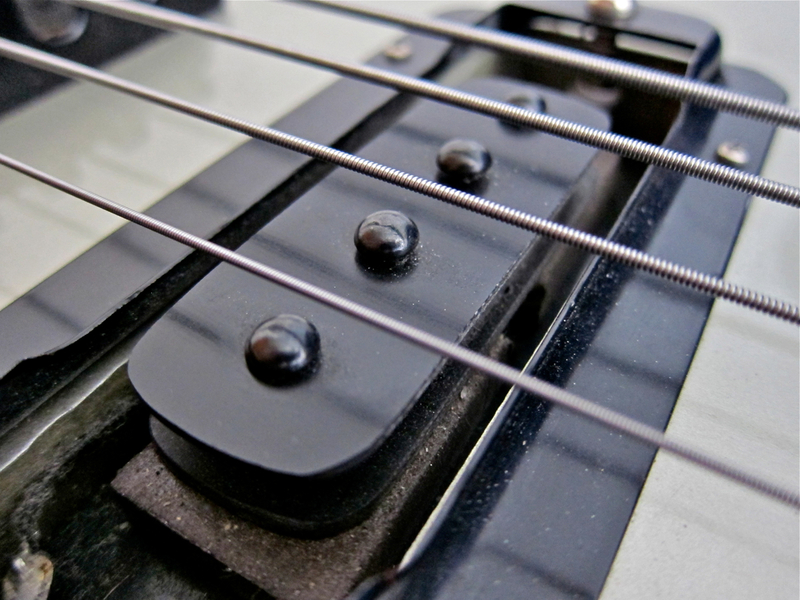 The neck pickup is powered by a single, flat bar magnet stuck underneath the bobbin. 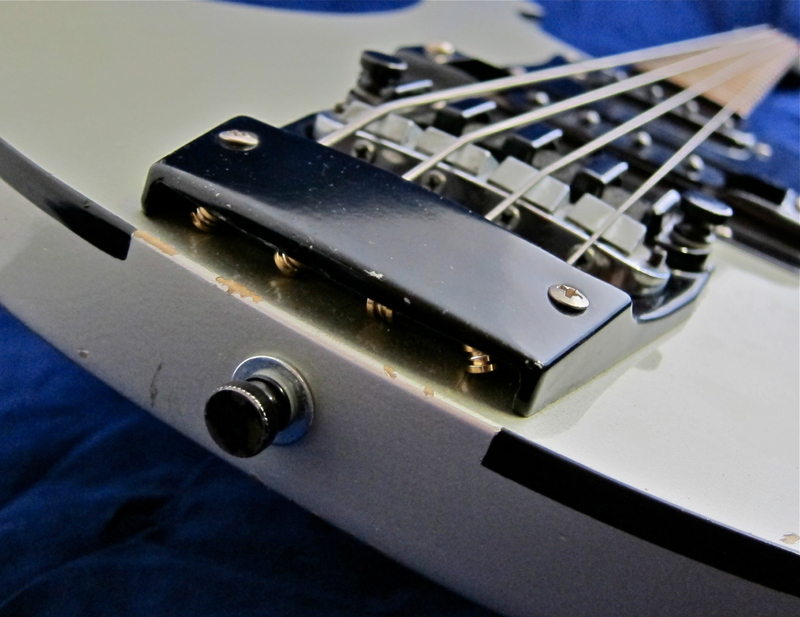 The 4003’s distinctive bridge pickup tone of the Eighties model is produced by using a unique, thick rubber/ceramic-compound magnet that has a large gap (for the wiring) on the fingerboard-facing side. The hand rest has been removed by the previous owner. 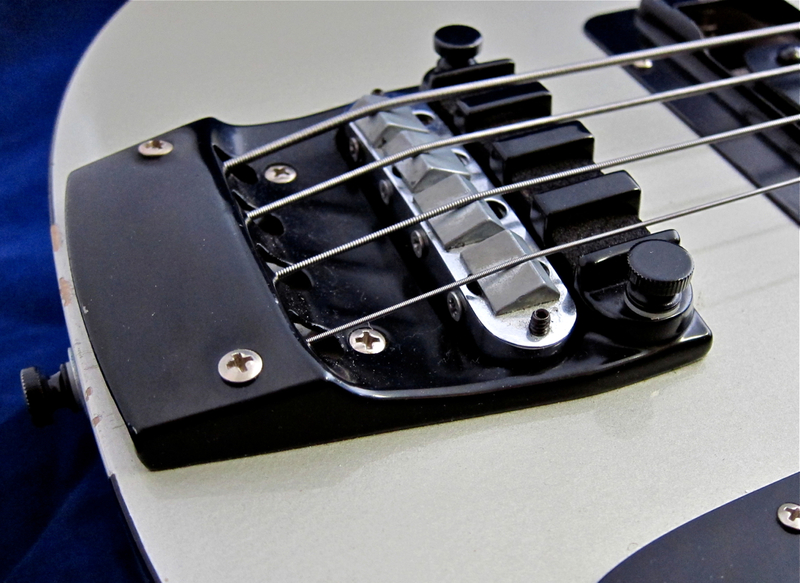 The Rickenbacker bass bridge stands in its own recess inside the combined tailpiece and mute assembly. 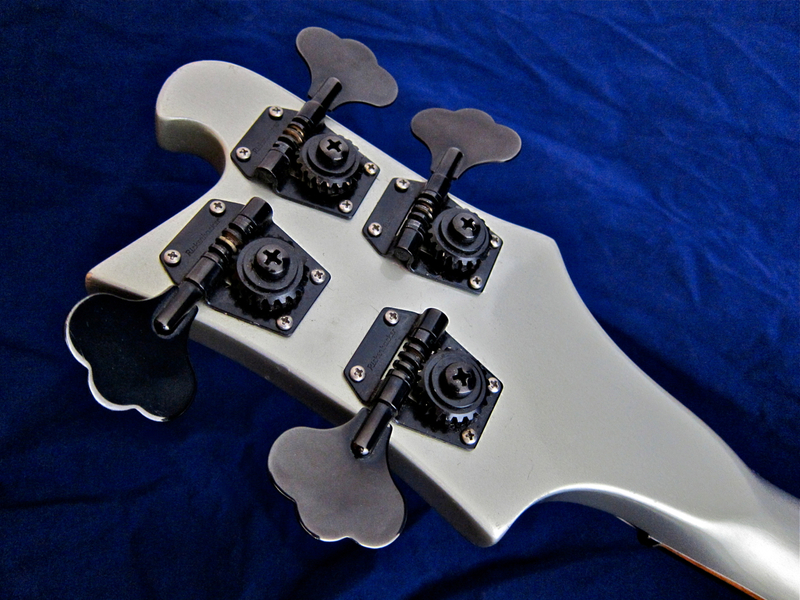 In the Eighties Rickenbacker experimented with different tailpiece thicknesses, leading to quite a few bridge assemblies featuring two additional screws close to the ball ends. These factory-installed screws keep the – slightly too flexible – tailpiece from being bent out of shape by the string pull. 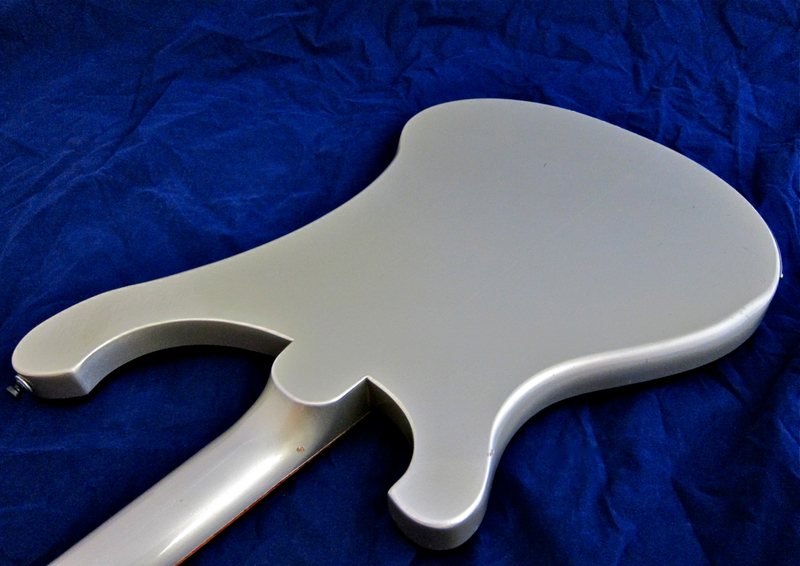 The body binding on Rickenbacker basses is usually glued to the body wings before the wings are attached to the through-neck. Look closely, and you’ll be able to spot the glue-lines demarcating the through-neck. 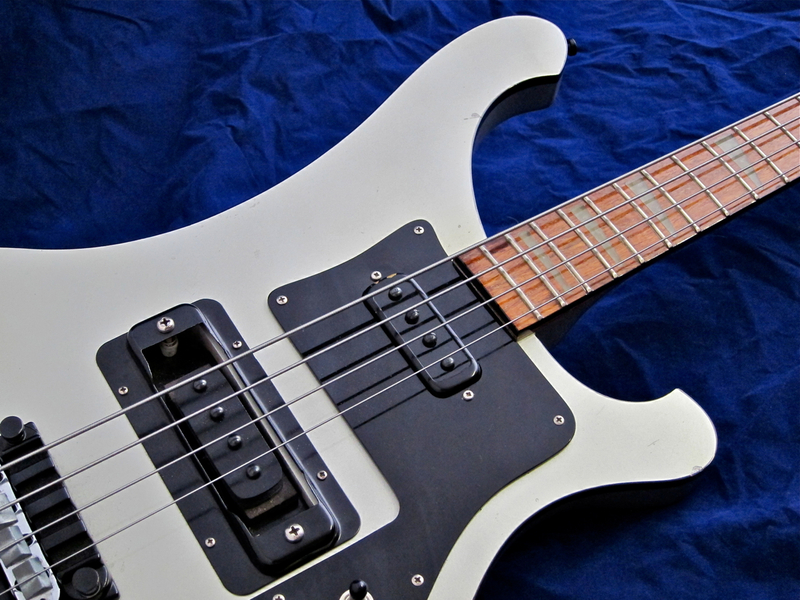 Rickenbacker used several different numbering schemes throughout the decades. In 1987 they introduced a new numbering system with a letter indicating the month of production (A = January) and a number standing for the year (0 = 1987). Additionally there are four numbers on the lower edge of the jack plate (digitally wiped from this photograph). The Rick-O-Sound-output is for use with a Y-cable (stereo plug to two mono plugs), splitting the pickup signals for use with two amplifiers or for adding different effects to each of the pickups. Just as mine also from january 1987 except my Rick’s color is mapleglo. Reblogged this on Musiikki, joka ei kiinnosta ketään. what strings did you use when recording?? thanks!